With an operating weight of 200-204 tonnes in excavator configuration and 195 tonnes in shovel configuration, the PC2000-8 is powered by a Tier 2-compliant Komatsu SAA12V140E-3 engine rated at 713kW, and is suitable for loading up to Komatsu HD1500-sized (150 US tonne-capacity) rear dump trucks. 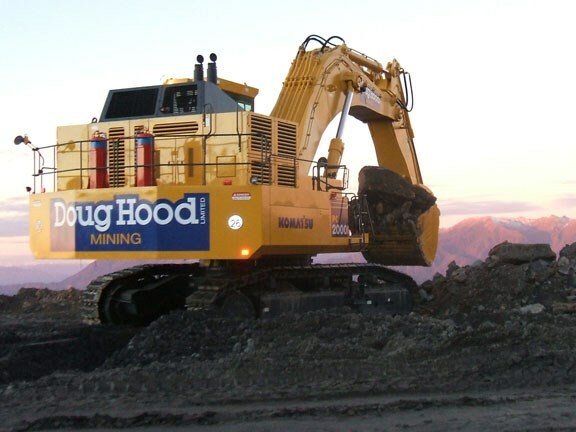 The first of these units in New Zealand was delivered to Doug Hood Mining, in mid 2008, for overburden removal operations at the West Coast’s Stockton Mine. 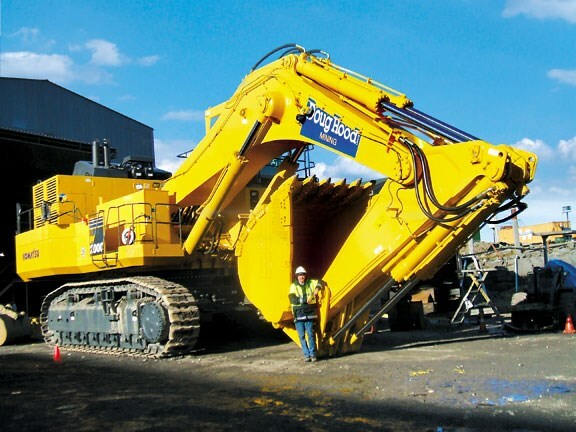 Fitted with an 11m³ backhoe bucket, it is used for loading Komatsu 785 and Cat 777 dump trucks. 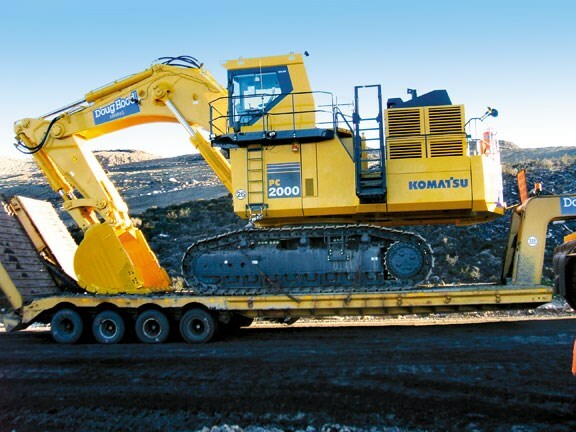 According to Steve Haines, Komatsu New Zealand’s sales manager, the PC2000-8 has a number of key features designed to increase safety and productivity, while reducing operating and maintenance costs as well as fuel consumption. 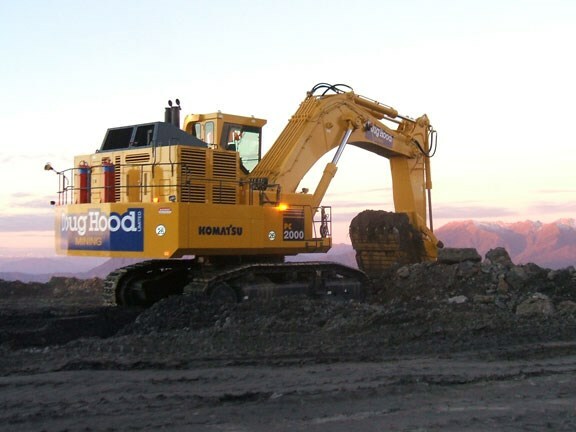 "As with other Komatsu mining and construction products, the PC2000-8 offers a unique combination of industry-leading technology and componentry, all designed and manufactured by Komatsu to work together as an integrated whole." Safety features on the PC2000-8 include Komatsu’s OPG (operator protective guarding) Level 2 guarding system. Meeting the latest ISO standards, the OPG is integrated with the cab as standard equipment, and in combination with a retractable seat belt, protects the operator from falling objects. Other safety features include improved operator visibility, an emergency stopping device and fuel-cut lever, anti-slip plates and an engine firewall. Cab volume is 30 percent greater than on the earlier model, and includes an advanced air suspension seat and low in-cab noise and vibration levels, along with a large high-resolution TFT-LCD monitor. An integrated power management system delivers optimum engine and hydraulic power as required, while power losses in hydraulic system, cooling fan and PTO are minimised through Komatsu’s Total Power Management system. An "economy mode" and Eco-gauge screen further contribute to reduced fuel consumption; compared with its predecessor PC1800, fuel consumption is 10 percent lower. A 3400-litre capacity fuel tank allows non-stop 24-hour operation between refills. Operating costs are further reduced through increased oil and filter change intervals, 30 percent fewer parts than the PC1800, larger and stronger components, and the use of a "power module", containing the engine, radiator, oil cooler, hydraulic pumps and PTO packaged within a single easily removable unit. Maintenance requirements on the PC2000-8 have been reduced compared with the previous model, Haines says, and he believes this is now one of the lowest-cost excavators in the 200 tonne class. "Its ease of maintenance through the power module concept, longer change intervals and sophisticated on-board monitoring make it a very inexpensive excavator to own and operate." To read in-depth machinery reviews, see the latest issue of Deals On Wheels magazine, on sale now.